Finishing the nine lessons of Financial Peace University is only the first step on your journey to true Financial Peace. In fact, this is where your story really takes off! You should have a sense of accomplishment and pride in completing the course. We provide a certificate of completion that you can access after you have completed the final lesson, The Great Misunderstanding. 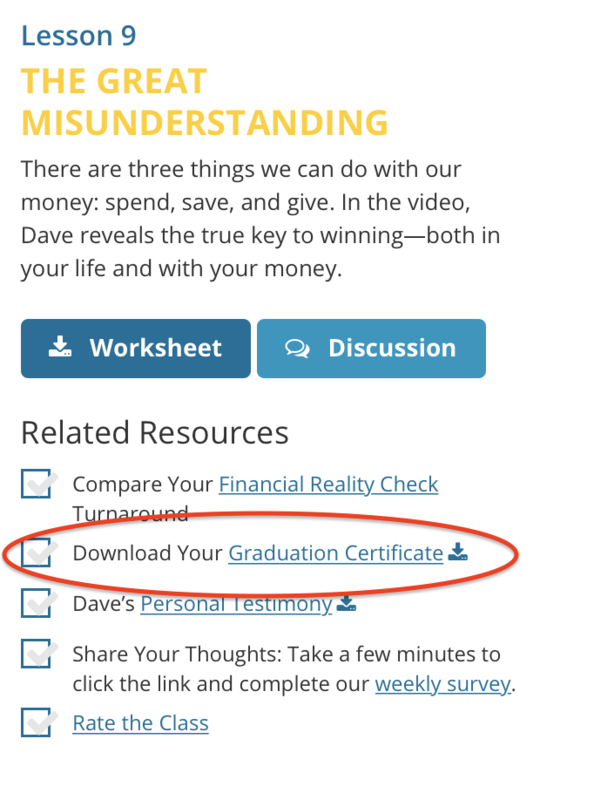 You will find a link to print your certificate under the Related Resources for Lesson 9 next to the video player. Please note that you can only print this after you have completed lesson nine, based on your lesson schedule. FPU Members who are registered for a class will need to get their certificate from their class coordinator.